When Kyle over at Tathata Golf (www.TathataGolf.com) informed me that they were having a launch party to celebrate the new 60-Day Training Program and membership platform, I was excited. When Kyle mentioned that he was inviting Jack Nicklaus, Greg Norman, and Annika Sorenstam to help launch the program, I was even more excited... and when Kyle invited me to help celebrate the occasion, I punched a hole in my wall with excitement. For years, I had watched these legends dominate the sport and now I was getting the chance to meet and photograph them. 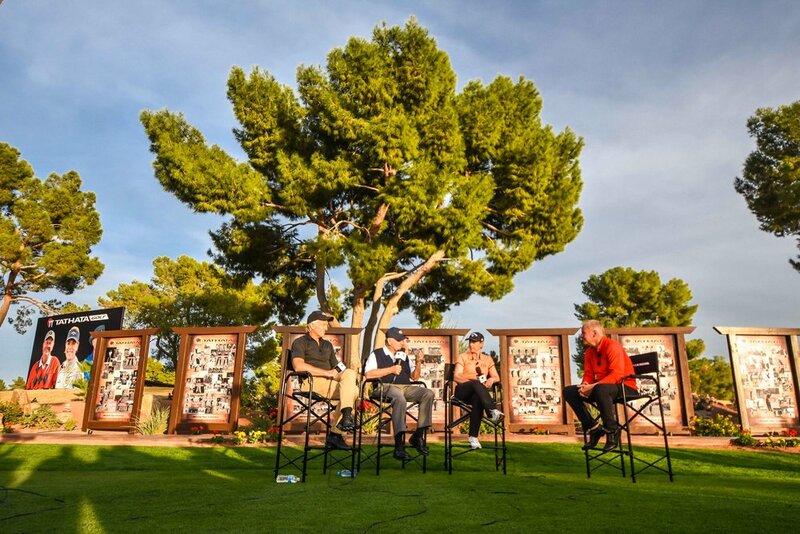 Since Tathata Golf's teaching foundation is based on the movements of the greatest golfers of all time it only made sense to have Jack, Greg, and Annika join in the presentation and launch of the new training platform. Greg Norman, the best driver of all time, was going to walk us through his approach to driving the golf ball. Annika Sorenstam, the best female golfer of her generation, was going to demonstrate her wedge game. Jack Nicklaus, the best pressure putter of all time, was going to share his thoughts on putting. The evening would conclude with a $1 million closest to the pin competition with the proceeds going to the winner's charity of choice. The event was aptly titled "A Celebration with the Greats" and it would be streamed on the Golf Channel. Annika's approach to the wedge game is simple, Every time she gets a wedge in her hands, she is looking to place the ball inside of 10 feet. She has created a very repeatable fluid motion that allows her to do this consistently. Although it's no surprise, Annika stresses practice and really being able to get a feel for those shots inside of 100 yards. It is a pleasure to watch as she drops wedge after wedge right next to each other. Annika was going to be tough to beat in the million dollar closest to the pin competition. Pick the smallest target you can, every single time. Small... I mean the leaf on a tree 400 yards away small. Try to hit the front of the golf ball and not the back of it. This is a great way to visualize and feel the acceleration through the impact zone. Greg Norman is the man. Even at 62, with large gaps of time away from the game. Greg steps up and bombs the driver like a 30 year old. It's not often that Annika or Greg aren't the main attraction at an event, but when Jack Nicklaus is in the building, all eyes are on the Golden Bear. With 18 major championships to his name, Jack is arguably the best golfer to ever walk the earth. Jack starts off by highlighting the importance of keeping your eyes directly over the ball and strokes a couple of putts. It is a surreal feeling to be on the same putting green as Jack Nicklaus and at one point Bryan Hepler, the Founder of Tathata Golf, comments "Isn't this the coolest? Just hanging out with Jack and watching him roll some putts?" Jack's head covers are cooler than yours. Jack's philosophy on putting centers mostly around the importance of speed. Three putt avoidance is important to Jack and he likes those second putts to be stress free. He recalls several seasons when he made it to June or July on the tour without a three putt. Most of us are lucky to make it to the third hole. Jack doesn't just stick to the putting stroke and offers up his thoughts on the full swing. Nicklaus clearly embraces a natural swing that develops from a golfer's own personal style. He also gives a few lines on today's competitive landscape. "Jordan Spieth will be a much better golfer than he is today." So Jack is clearly on the Spieth Wagon with the rest of us. There is even a discussion about the whereabouts of a putter Jack used to win the Masters. Apparently those things are valuable. Side note: If anybody knows where the Lynx putter that I used to win the 1994 Junior Varsity Bruin Invitational is, please let me know. This quote may NOT have actually happened. Greg, Annika, and Jack pose along side Bryan of Tathata Golf. The roundtable discussion on the grounds of the Tathata training facility. After the roundtable discussion winds up, it is time for the $1 Million shootout. It's a 60 yard wedge shot and they only get one shot, closest to the pin wins $1 million. Not to be left out, each runner up receives $200k for the charity of their choice. The Greats warm up and give the honor to Annika. Like a champion, she sticks it to 3 feet. With the pressure on, Jack finds the sand and Greg catches it heavy. Jack later laughs "Greg and I couldn't get it over a bunker 40 yards away." At 77, his game isn't what it used to be, but his mental outlook remains solid and fun. 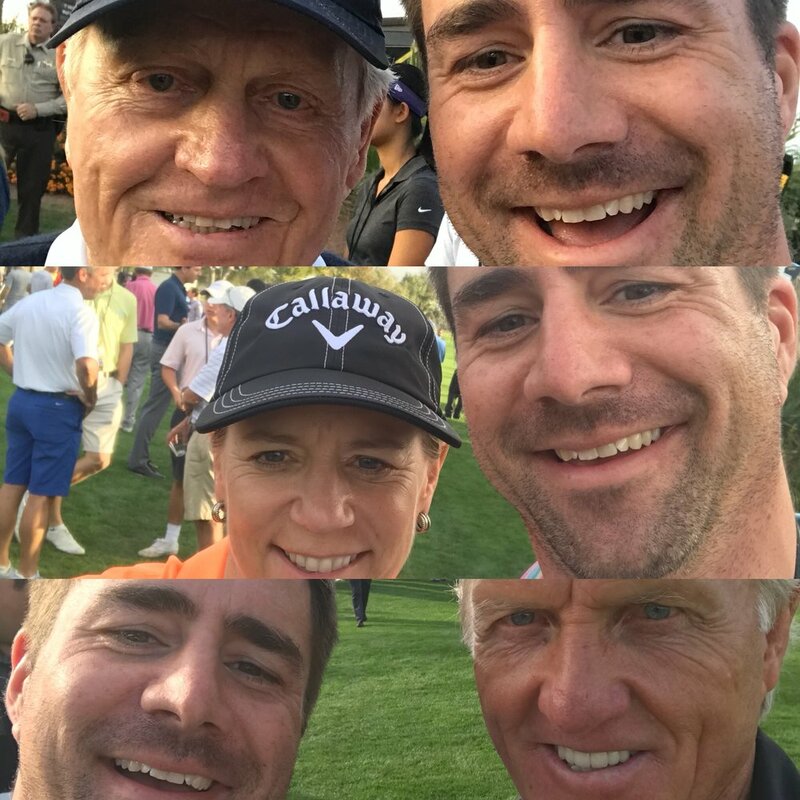 With any luck, you picked up one or two takeaways from this post, I know I picked up 2-3 strokes just by meeting these legends. It was truly a special treat. If you are looking to improve your game at all, I would suggest checking out Tathata Golf and their new membership platform. It contains a variety of beneficial features in a Netflix-like user experience; training courses, weekly TV shows, 200+ Video Library, and mobile companion app. If it's special enough to attract these champions, it is worth a moment of your consideration. Jack, Greg, and Annika were gracious with their time and met everyone at the party. The sun sets on Tathata Golf and one of my favorite golf days.